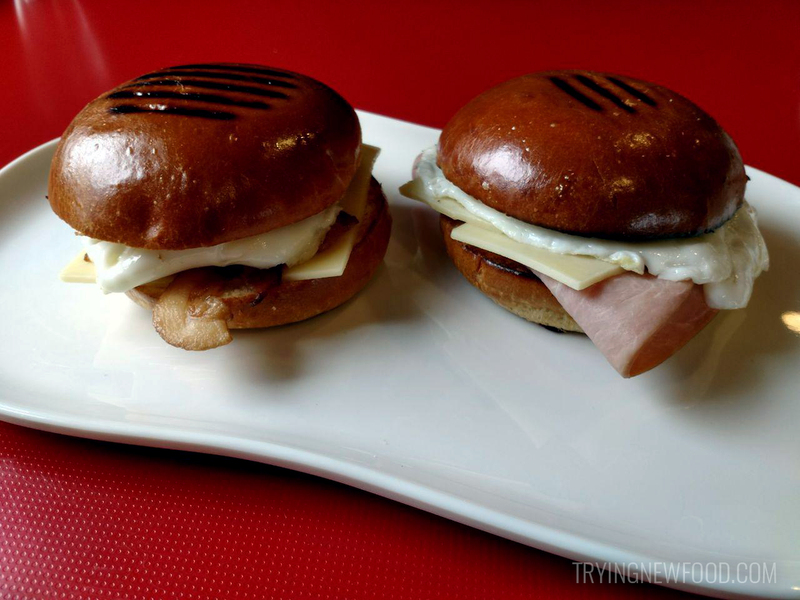 You’d think it would be a given, that if they had bacon and sausage, it would be easy to just put ham on these brioche sandwiches as well. But there was some confusion and our cashier had to go ask someone if that could be done. Luckily, they were able to sub ham in for the bacon. 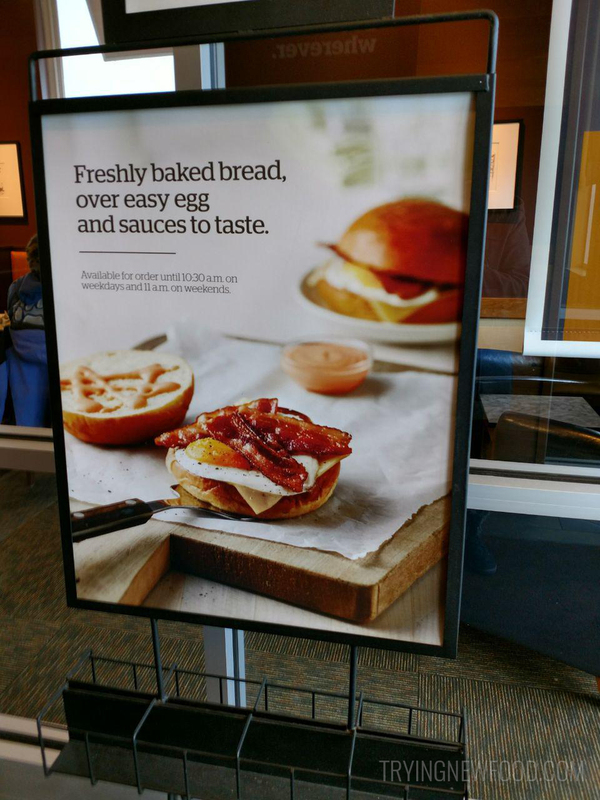 They even had a sign right in front of the register showing the new breakfast sandwich. In the image below, on the left is the bacon, egg and cheese on brioche, and then the right one is my husband’s custom ham, egg and cheese. …RUNNY YOLKS! They have an option to get the eggs over easy, and it make the sandwiches taste heavenly. Tip: make sure to bite into the yolk early on so it covers all the inside ingredients. My husband got to it after taking a few bites, and ended up with too much egg and not enough sandwich left to enjoy it. He’s not like me… I love yolks so much I’d eat them all on their own. I have a problem, I know. Next up is this new raspberry almond thumbprint cookie they had on display. It was not crunchy at all, but soft and slightly crumbly. Oh, and it was extremely covered in powdered sugar. Which I managed to get multiple times on my coat sleeve and all over my pant legs. Even though I was trying to be very vigilant. My jacket now has a giant white smudge on the sleeve I need to figure out how to remove. 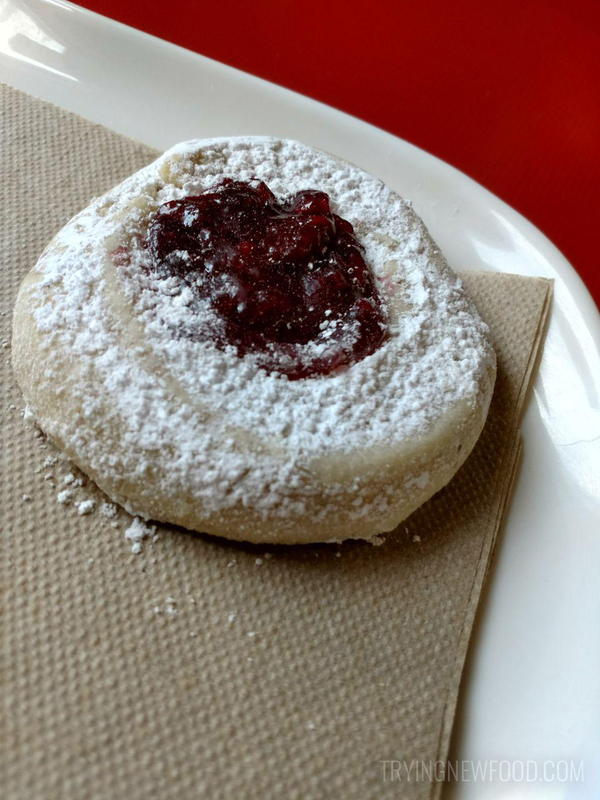 But it was delicious, the lightly sweet cookie and the raspberry middle made it difficult to split between the two of us. Should have ordered one for each of us. I’ll probably skip ordering this next time since it was too messy for me. Any time I get near powdered sugar, it ends up on me. Especially if I’m wearing any black. 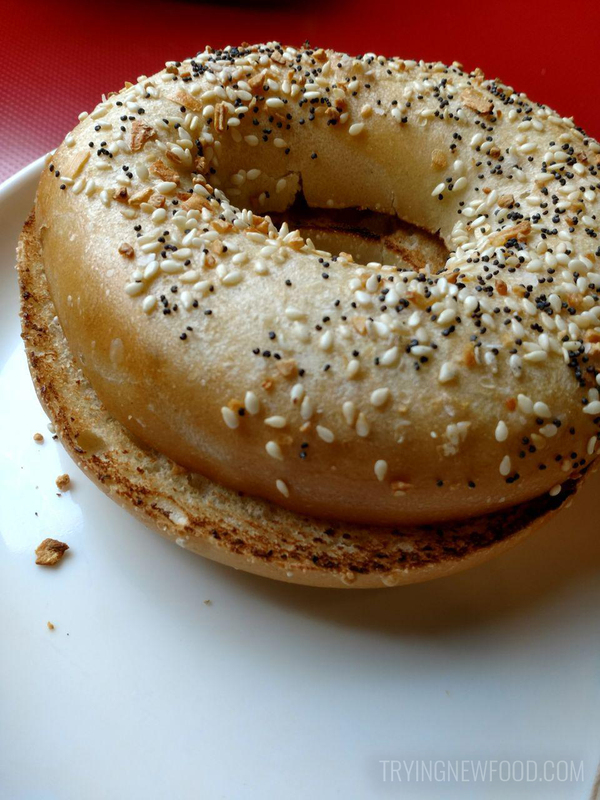 Last, but not least—the everything bagel. I wasn’t planning on ordering a bagel, but it was free on my rewards card. This seems to happen to me a lot. They offer free bagels pretty often. It’s sliced and toasted, with the traditional everything bagel toppings. I had no idea until I was searching online for their cream cheese info, but Panera seems to be some sort of cream cheese crisis. They are recalling cream cheese over listeria fears, according to CNN. Which explains why my cream cheese was in a generic clear to go plastic cup with lid vs. their traditional branded cream cheese little plastic tubs. Wow, that was more than I planned on writing about this bagel. All in all, it was a good bagel. Everything bagels are my go to when I can’t decide which flavor to pick. If you made it this far, let me know what your favorite breakfast choice is at Panera! 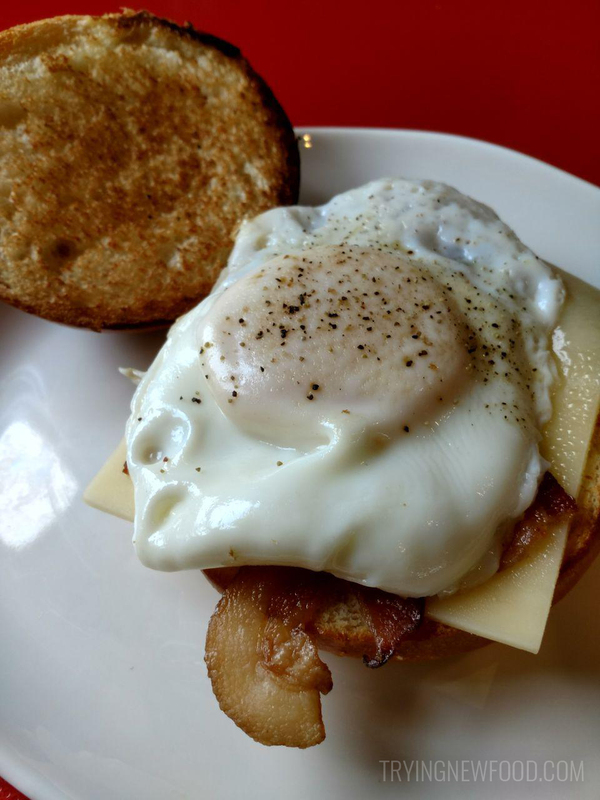 Would you even try the Panera Bread bacon, egg and cheese on brioche? That runny yolk is gorgeous! Will definitely have to give it a try next time I go to Panera for breakfast.